Burberry Weekend For Men is a laidback and casual aftershave for men that refreshes the senses and makes the skin awash with a tingly sensual sensation. 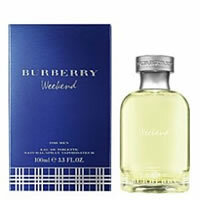 Burberry Weekend For Men allows you to indulge yourself with the comfortable, casual and relaxing aroma of bergamot, mandarin orange, lemon, grapefruit, followed by juicy pineapple and melon. Ivy leaves, sandalwood, oak moss, amber and honey.